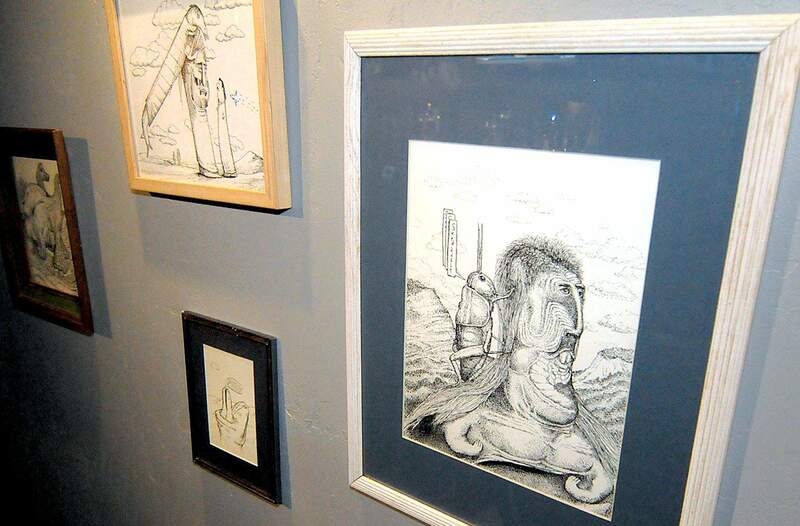 From left, Two Birds on a Knoll, Ape Genesis and Cold-Hearted Orb by Dan Groth hang as part of this months Art Spectacle at The Lost Dog Bar & Lounge. 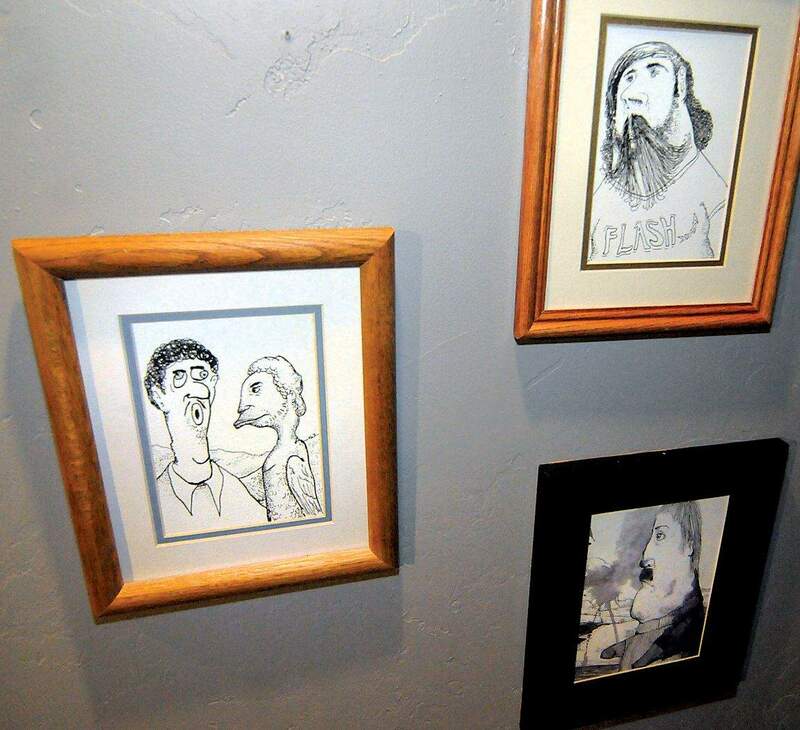 From left, titles like Brachio Folk, Fish Flopper, Peep and Skedaddle merely hint at the uniqueness of the work of Dan Groth at The Lost Dog Bar & Lounge. 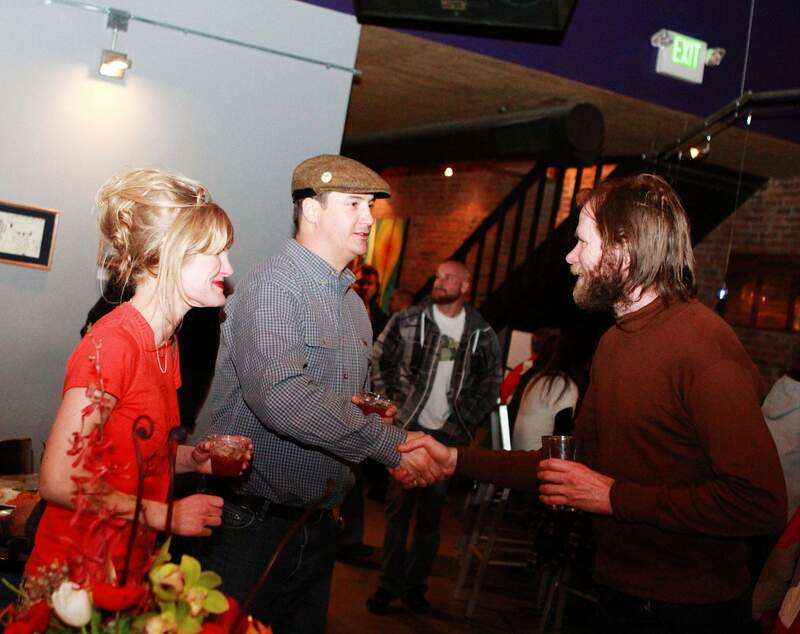 Kristen Smith and Erik Mischker greet Dan Groth at Saturdays opening of Groths show at the Lost Dog Bar & Lounge. 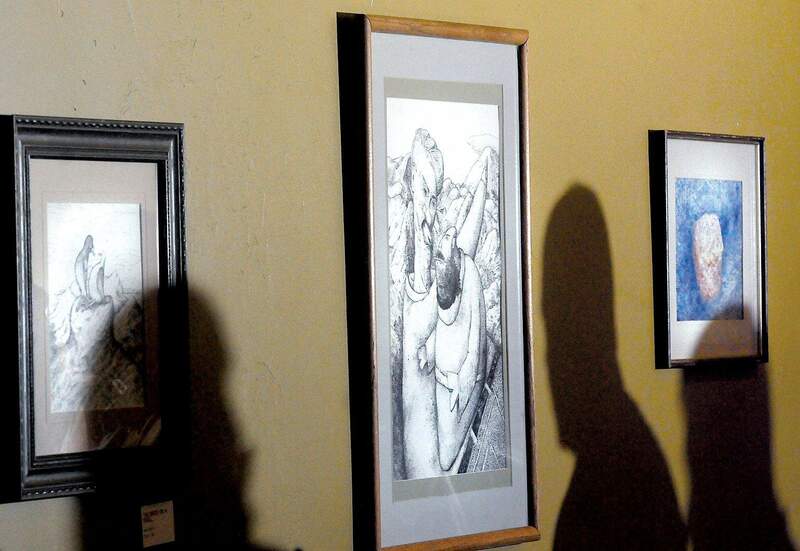 Clockwise from left, Duo, Flash and Ivanovich are three pen-and-ink works by Dan Groth among this months Art Spectacle by the Durango artist at The Lost Dog Bar & Lounge. The Lost Dog Bar & Lounge is quickly becoming the place for local artists to make their mark. Each month, the Main Avenue restaurant gives a different artist a shot at showing his/her stuff to a wide audience, most of whom have no idea theyre walking into a genuine art display when they sit down for lunch or dinner. I think shows in restaurants and coffee shops are better than galleries as far as getting your name out there, said Dan Groth, who is the star of the Lost Dog Art Spectacle for January. And Groth isnt just blowing smoke  he sold about half of his work at Saturday nights opening. He may be just making his first mark on the local scene, but that kind of response indicates good things to come for Groth. He would never admit it himself, but the mans a genius, and his collection of pen-and-ink drawings offer viewers a glimpse into what goes on inside a mind that never stops running. Its interesting, people react to it, and Im good at it, he said, explaining why hes chosen the pen-and-ink style over painting, though he does still dabble with watercolors. He was a cartoonist for his high school paper in Boulder and at Luther College in Decorah, Iowa, and his recent work hints at that background. But as to whats in the drawings, even he struggles to explain. And no, its not drugs. A lot of it comes from old sketch books, and some of the weirdest stuff was drawn when I was in high school before I was ever exposed to any substances, Groth said. Ive always been into dreams and trying to capture that stream of consciousness, like Ill start with animals with human characteristics and go anywhere with it, Groth said. If that sounds confusing, its because it is. And throw in influences such as a degree in archaeology and a fascination with Russian literature  trying to describe one of Groths drawings could take weeks. Youd still be no closer to understanding what it looks like. Theyre a combination of fantasy, darkness, humor and satire done with skill and precision but with enough of a human touch to erase any doubt theyre freehand compositions. Appendages dont always match bodies in terms of scale, which adds to the surrealistic images of his human figures. Its wonderfully baffling stuff. Groth said he hopes this solo show kick-starts his foray into the world of a working artist. After settling in Durango after college in 1998, he left and tried his hand as a professional musician with a band in Portland, Ore., for a few years before returning last spring. Future projects include printmaking and book illustration, for which he seems perfectly tailored. Im at a point in my life where I want to make money at my art, said Groth, who like so many artists in this town has worked countless jobs to pay the bills while paying his dues. The early success of the Lost Dog show should serve only as further encouragement. Its worth a look (or two), and remember, even if it all doesnt make sense, dont blame the artist  he knows what hes doing. Its up to the rest of us to figure it out. The Lost Dog Art Spectacle featuring Dan Groth will remain on display through Feb. 2 at the Lost Dog Bar & Lounge, 1150 Main Ave. For more information, call 259-0430 or email warmgrimace@gmail.com.